The finalists from the last two trophy matches in Auckland, Venus Williams, Ana Ivanovic and Caroline Wozniacki headline a reasonably strong line-up for the International event in Auckland with all eight seeds from the world’s top 45. Always attracting excellent crowds, Auckland is one of the best International events of the year and a fun one to follow. Let’s take a look at the draw…. 1. 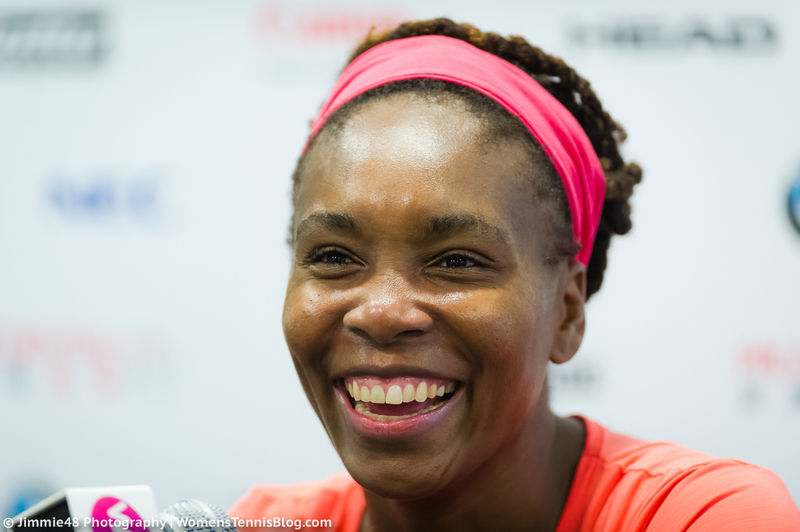 Tough openers for the top seeds: Venus Williams and Caroline Wozniacki both have testing openers to their 2016 campaign; Venus takes on one of the contenders for the 2015 WTA Newcomer of the year, Daria Kasatkina, while Wozniacki opens against the gutsy, Danka Kovinic. 2. Watch out for the ‘rising stars’: Many of the promising up-and-comers are here in Auckland which make it a very engaging draw. As well as Kasatkina and Kovinic, the likes of Nao Hibino, Jelena Ostapenko and Carina Witthoeft are also present in the main draw. Ana Ivanovic (2): The first match of Ivanovic’s 2016 season will be against a qualifier with a potential second round match against Johanna Larsson or Jelena Ostapenko. Ivanovic has never lost before in Auckland, having beaten Venus to the title in 2014 in an entertaining three set final. After an injury-affected 2015 and admitting towards the end of last year that her mind was already focused on off-season preparations, optimism should be much higher for Ivanovic in 2016. Caroline Wozniacki (3): The Dane returns to Auckland after reaching the final in 2015. While the season started in reasonably high spirits, it petered out with a second half that was dominated by injuries. Pictures from Wozniacki’s social media accounts suggest she had an encouraging off-season. Wozniacki’s first match of the year will be against Danka Kovinic, a talented young player, whose best results have been on clay; however she did reach her first WTA final at the end of 2015 in Tianjin. Svetlana Kuznetsova (4): The Russian player finished in the world’s top 30 for the 11th time in the last 12 years. Of the eight seeds, Kuznetsova has drawn the most challenging first round match against Mona Barthel who was the first player to miss out on a seeding in Auckland. In their only previous match, Kuznetsova beat Barthel in Marbella in 2011, 4-6 7-6(4) 6-4. It is worth noting that Kuznetsova suffered first round losses in Auckland in 2013 and 2015, and is generally a little slow out of the blocks after a lengthy break from the tour. Sloane Stephens (5): Sloane will play Polona Hercog in the first round of Auckland. It was recently announced that she has stopped working with her coach, Nick Saviano, which came as a surprise considering they had a generally successful 2015. The impact he had on Stephens’s game, particularly her mental application in matches, was evident. While Stephens is still very inconsistent, it would still come as a surprise to see her not reach the quarter-finals. If she reaches the second round, she will play either Carina Witthoeft or Tatjana Maria. CoCo Vandeweghe (6): An all-American first rounder is set between CoCo Vandeweghe and Irina Falconi. Vandeweghe finished 2015 with her highest season-ending ranking, propelled by a wonderful run to the quarter-finals at Wimbledon. Vandeweghe will have to overturn a 0-2 head-to-head record against Falconi although they haven’t played since 2012. If Vandeweghe wins, she could face a US Open rematch with Bethanie Mattek-Sands in the second round. Barbora Strycova (7): A semi-finalist in Auckland last year, Strycova will open her 2016 season against a qualifier. After a super start to 2015 that saw her win the most matches she has ever done down under, the wins didn’t come so easily in the second half of the year. Strycova is projected to play a big hitter in the second round; either Julia Goerges or Lucie Hradecka, who meet in a helmets-at-the-ready first rounder. Alison Van Uytvanck (8): Sneaking the final seed in Auckland, Alison Van Uytvanck will play Alexandra Dulgheru in the her first main draw appearance in Auckland. AVU spoke about her 2015 year in a VAVEL article written by Max Gao (see HERE). She could play Yulia Putintseva in the second round who she has won just four games against in two previous encounters. International draws are always a little wacky so expect upsets. I like Yulia Putintseva‘s chances of reaching the quarter-finals, opening against Marina Erakovic who is making her comeback following several months out due to a knee injury. In the second quarter of the draw which features Svetlana Kuznetsova and CoCo Vandeweghe, i’d fancy an unseeded player to come through… at the time of writing (waiting for the placement of qualifiers) i’m favouring Bethanie Mattek-Sands. BMS rose over 100 ranking places in 2015 after being sidelined the year before for a hip injury. Towards the end of 2015, it finally started to click for the American player who reached the third round of the US Open and concluded the year in Beijing with five match wins. BMS will play a qualifier in the first round. Who do you think will win the 2016 ASB Classic in Auckland? Have your say in the tournament poll below and as always, comments are appreciated. January 2, 2016 in Auckland, Tournament Preview, WTA. I’m rooting for Ana Ivanovic (duh). She has a decent draw and the courts suit her. You shock me… I couldn’t decide between Ana and Caro who I expect to meet in the semi-finals. As both aren’t playing the week after, it is a big week for both. lol..I’ll have better odds counting on Andrew to cheer for Ana than I probably would Ana herself to come through. At least I know he will be there to the end. Let’s hope she proves me wrong this 2016 season. Sloane Stephens is my dark horse, should she beat Ana. (Aside) Judging by the teams in Hopman cup, it seems the Rio Olympic mixed doubles is going to be damp squib. Where is Laura Robson when you need her !! Good to see Serena Teaming with Sock for the tournament with a certain ‘mutual someone’ getting in the way. #correction: certain ‘mutual someone’ not getting in the way. Wow, either of that combo will amazing, especially Carla and Nadal, exciting thought. I think the Rio mixed doubles line-up could be awesome. I’m not feeling so excited about the Hopman Cup this year though with quite a few withdrawals already. I think the Lisicki-Zverev partnership could be a great one. I noticed that Victoria Duval was at the HC party so I wonder if she’s there as a possible stand-by in case Serena pulls out? Hopefully come Rio, there will be more partnerships like the Miryni/Azarenka one in London 2012. Lisicki-Zverev has huge potential. I only hope Sabine can stay injury free till then. Interesting observation about Duval, although Serena was looking her shiny best in those party photos. Will be a shame if she pulls out. Great to see Duval back after her health scare, but I don’t think she is match fit enough to cause any waves. There’s often withdrawals so I think they must have some players on the sideline just as a precaution. I’ I’d love to see Nadal with CSN or Muguruza for Rio. If Ana meets Venus in the final, I’m going for Venus. ..If someone else meets Ana in the final, then, she gets my vote. This event has a good mix of baseline and ground stroke tennis. Been meaning to comment on other articles for a while but something in the Auckland draw caught my eye and forced my hand: if they get through their respective first round matches against Mona Barthel and a qualifier, Svetlana Kuznetsova and Francesca Schiavone will meet in round two! Forget the rest of the tournament draw (intriguing as it is); having just recently done the charting of the 2011 Australian Open Kuznetsova/Schiavone epic for the TennisAbstract database, I am incredibly excited at the mere prospect of seeing this matchup happen, especially given how spectacular their Roland Garros clash was just last year. Everyone start praying to the tennis gods! Good spot! Their match at the Australian Open was fantastic and i’m still gutted that I never got to watch their match at the French Open. I’ve looked everywhere for a replay or just highlights but couldn’t find any. What an upset by Kasatkina! Venus was making loads of errors on important points and also Kasatkina played very well! Upcoming youngster and I hope she’ll break the Top 50 soon. Kasatkina is a promising talent and she had a super end to 2015, definitely one to watch. Venus was pretty ragged though and made so many errors. Now Ivanovic is upset by Broady! The draw is WIDE open! Now my favourite to win this is either Stephens, Wozniacki or Kuznetsova. Wozniacki has 2 big threats ahead of her, McHale, who had upset her 2 times, and Dulgheru, who had taken a set off her once. The only problem for Svetlana and Sloane are inconsistencies and unable to follow up wins. This one really surprised me! An amazing result for Broady. She had a lot of bad luck early in her career; owing to an irresponsible campaign against her from the tabloids after she was photographed on a night out, aged 17 (shock horror), she had her LTA funding cut off. It’s great to see she’s finally having some success.